EUtopia - our European Dream City: We appy for Quality Label! We appy for Quality Label! Are you enjoying your holidays? I am writing to remind you that you have the possibility to apply for the etwinning quality label. 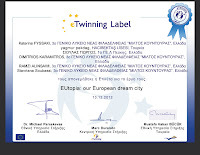 (Quality Labels are granted to teachers with excellent eTwinning projects). Today Stavriana submitted the application for the Lyceum "Miltos Kountouras". If you are interested, you should hurry up, because I'm afraid the deadline for applying is very close. On the etwinning platform you'll get all the information you need about the labels.